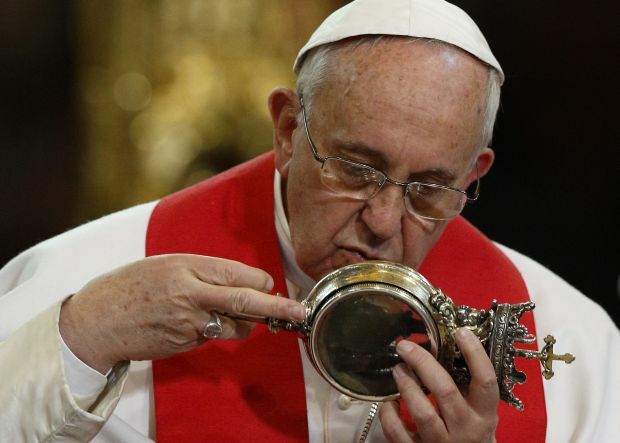 VATICAN CITY (CNS) — At the end of Pope Francis’ spontaneity-filled meeting with priests, seminarians and religious in the cathedral of Naples, the vial of dried blood of the city’s patron saint appeared to miraculously liquefy. The blood of the fourth-century martyr is Naples’ most precious relic. The townspeople gauge the saints’ pleasure with them by awaiting the blood’s liquefaction three times a year: in the spring during celebrations of the feast of the transfer of the saint’s relics to Naples; Sept. 19, his feast day; and Dec. 16, the local feast commemorating the averting of a threatened eruption of Mount Vesuvius through the intervention of the saint. When Pope Benedict XVI visited in 2007 and the blood did not liquefy, Msgr. Vincenzo de Gregorio, custodian of the relic, told reporters the miracle had never occurred when a pope visited on a day other than the feast day. Entering the cathedral, Pope Francis’ white cassock and his arms were yanked repeatedly by priests, seminarians and nuns wanting to touch him or attract his attention. Calmed reigned briefly after the pope reached the altar, but then Cardinal Sepe told the pope that, in accordance with canon law, he had given formal permission for the nuns in Naples’ seven cloistered convents to go out for the day. The nuns, who had been seated in the sanctuary, broke free, running to the pope, surrounding him, hugging him, kissing his ring and piling gifts on his lap. When order was restored, Pope Francis stood with several sheets of paper and told the congregation, “I prepared a speech, but speeches are boring.” So, he put the papers aside, sat down and began talking about how Jesus must be at the center of a consecrated person’s life, about life in community, about poverty and mercy. “The center of your life must be Jesus,” he said. Too often, people — including priests and religious — have a difficulty with a superior or a confrere and that problem becomes the real center of their lives, robbing them and their witness of joy. Money definitely cannot be the center of the life of a priest or nun, he said. Even a diocesan priest, who does not take vows of poverty, must make sure “his heart is not there” in money.